Before embarking on making my own mufleta, I reached out to some of my Moroccan Jewish friends. The first thing I learned is that mufleta is the kind of recipe that doesn’t really have exact measurements – granddaughters ask their grandmothers for specific amounts. But often the only recipe that is offered is: use flour, yeast, salt, oil to make a dough, form into rounds, then fry in a pan in a stack. I was lucky to get some advice from a Moroccan Jewish friend and amazing cook, Adassa Kurkus. These tips were passed down to her from her own grandmother, and they helped guide me through the process which I’ve outlined in the recipe. From her, I learned how critical the oiling of the dough is in the process of forming each layer, and how a few holes here and there aren’t a big deal. 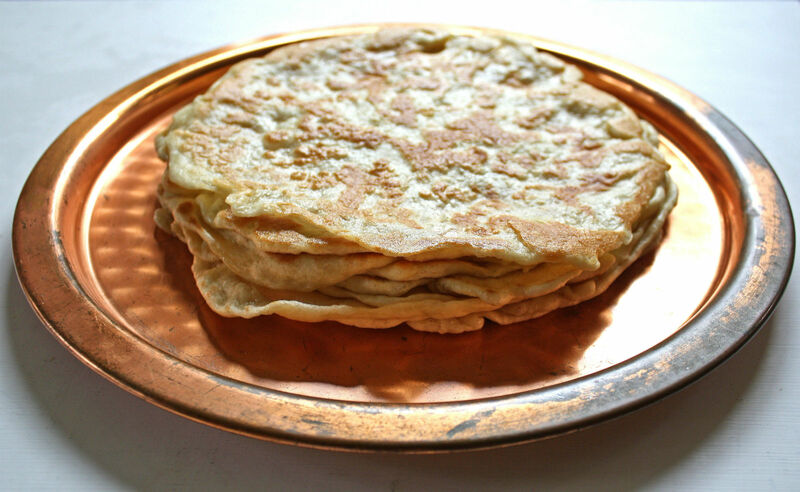 While mufleta is similar to crepes, the yeast in the mufleta dough offers a bubbly delicate chewiness that’s different from your average thin pancake. 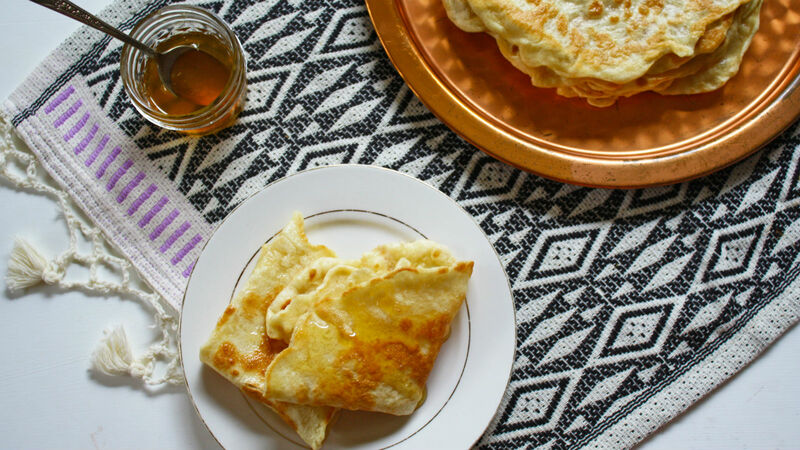 Mufleta is delicious topped with melted butter and honey, and it’s also good with jam, syrup, nuts, or even a savory eggplant spread. Combine the yeast and sugar with the warm water, make sure the water is not too hot or too cold, or your yeast won’t properly activate. Allow the yeast to get foamy and bubbly, about five minutes. Make a well in the flour, and then add the water and yeast mixture. Using your hands, incorporate the water into the flour. The amount of flour you need can depend on the brand of the flour as well as the humidity/temperature in your kitchen. You want the dough to be slightly tacky to the touch, but it shouldn’t stick to your hands. If you find your dough is too sticky, add a little more flour as needed. Once the dough is formed into a ball, knead the dough until smooth and elastic, about five minutes. Lightly grease the bowl with oil, and then place the dough into the bowl. Cover the bowl with a damp, clean dish towel and allow to rise for 40 minutes. Some folks form their dough into balls before letting it rise, and some prefer to do it after. Generously drizzle a baking sheet or pyrex with more oil. 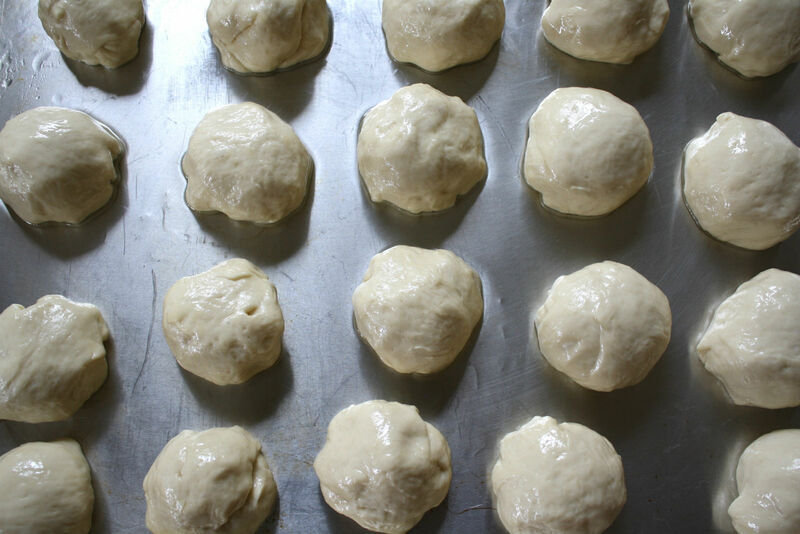 Pull off golfball-sized rounds of dough and form them into balls. Roll them in the oil and then let them rest for about 5 minutes. 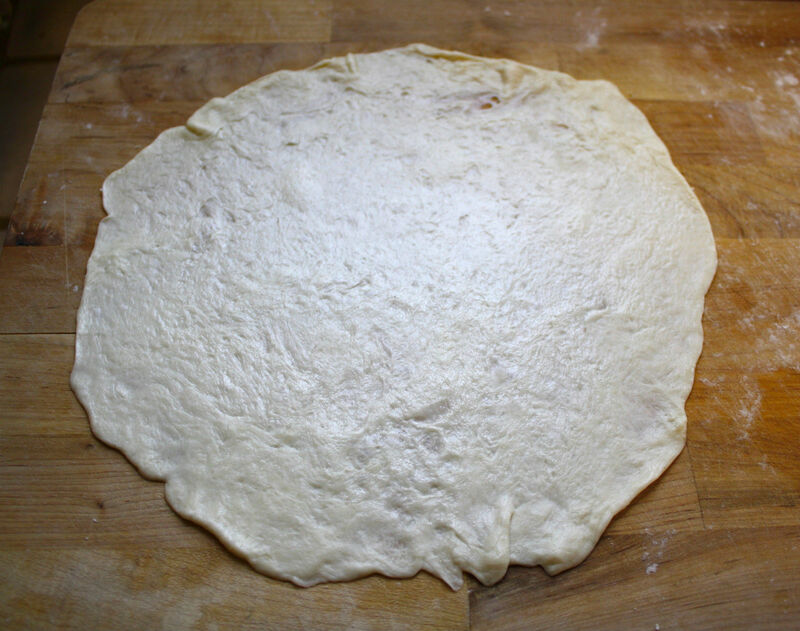 Form one round of dough into a paper-thin circle, about 10” in diameter. You want each layer to be as thin as possible, and you can do this by flattening and pressing the dough into a circle shape with your fingers, or with the help of a rolling pin. Don’t worry if a few small holes pop up here and there. Over medium heat, add a few teaspoons of oil to a large nonstick or castiron skillet. Place the first round of formed dough into the skillet. Turn down the heat slightly at this point and cook the mufleta over medium low, so that it doesn’t burn. Allow the mufleta to turn golden brown, and then flip it onto the other side. This is the only layer that will get browned on both sides. While the first side is browning, form the next layer of dough. Once you flip the first layer of the mufleta over, place the raw formed dough round on top of that cooked layer. Form another round of dough while the next layer is browning. Once golden brown, flip again and place another layer of raw dough on the top browned side of the mufleta while the bottom cooks. You can add a little more oil to the pan after each flip. Continue this process for as long as you can manage to flip the pile of layers. If the stack gets too big to flip, remove the entire stack, and begin a new one. Serve warm with melted butter and honey, or your favorite toppings. Vibrant red, yellow, and green colors, a spicy aroma, and delicate textures all come together in this perfect dish.